Google Earth, a popular virtual globe geography and mapping program, shouldn’t actually still be named Google Earth, instead, Google Universe may be a more appropriate name as it now incorporates Google Sky mode component, which allows you to view, visit and explore the cosmos space and the universe virtually and close-up. With the release of Google Earth 4.2, computer users can now tour the outer space and watch the stars and galaxies without firing into the sky in a space shuttle. Google Sky add-on to Google Earth is developed with partnership from some of the world’s leading observatories such as Sloan Digital Sky Survey, Digital Sky Survey Consortium which obtained photographic data from Oschin Schmidt Telescope on Palomar Mountain and the UK Schmidt Telescope and NASA/Space Telescope Institute, the science operations center for Hubble space telescope, the main source for Google Earth Sky add-on service where public astronomical images as well as color astronomical images of all of the archived data from Hubble’s Advanced Camera for Surveys will be added and shown, together with newly released Hubble pictures will be added to the Google Sky program as soon as they are issued. Google Earth Sky View showing Egg Nebula. According to Google Earth and Maps Team blog, there are 100 million individual stars and 200 million galaxies that can be zoom in to close up view and take a detailed tour in Sky. 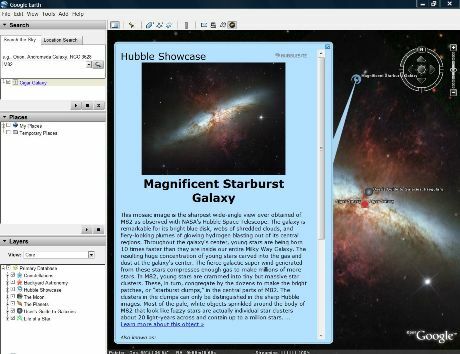 Google Sky allows users to zoom in to distant galaxies and nebulae, flip up and see the constellations, watch the movements of the planets, observe the shape of your own zodiac or astronomical sign such as Aries (The Ram), Taurus (The Bull), Gemini (The Twins), Cancer (The Crab), Leo (The Lion), Virgo (The Virgin), Libra (The Scales), Scorpius (The Scorpion), Sagittarius (The Archer), Capricornus (The Sea-goat), Aquarius (The Water-carrier) and Pisces (The Fishes), learn about the lifecycle of a star and different kind of galaxies. Users can also search for stars, galaxies, nebulae and fly through space inside Google Earth, or create and share own imagery, place marks and more. More importantly, there is additional function that will overlay maps, charts and user guides onto the night sky, describing in detail each identified astronomical objects including famous constellations such as Orion, Andromeda and Cassiopeia. Google Earth Sky features a beautiful galaxy photo of the Cigar Galaxy (aka M82, Messier 82 or NGC 3034), a magnificent starburst galaxy about 12 million light-years away in the constellation Ursa Major, complete with explanation and user guide. 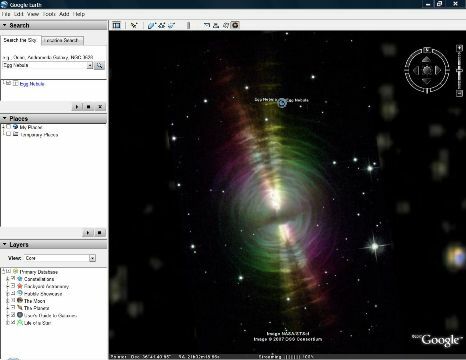 Oddly, the recently saw SN2006gy supernova is not found in Google Sky database. To use Google Sky, you need to download at least Google Earth 4.2 from http://earth.google.com/. Google Updater seems like haven’t pick up this latest release of 4.2 yet, thus you have to manually update for now. Once install and upgrade Google Earth, run the program, and click on the Sky button to switch to Sky mode feature. Alternatively, you can also click on “View” in menu bar and select “Switch to Sky” in drop down menu. To change back to Earth mode, click on Sky button again or choose “Switch to Earth”. The following video tutorial on how to use Google Earth Sky feature to explore the sky. Chinese language edition of the Google Sky user guide, no voice though. You can also explore the features of Google Earth with Sky Space info with Sally Ride, the first American female astronaut.